GoDaddy - How to retrieve EPP Domain Transfer Authorization Key Code - Knowledgebase - QTH.com, Inc. PLEASE NOTE: We are not affiliated with GoDaddy and cannot help you with any of the steps below. 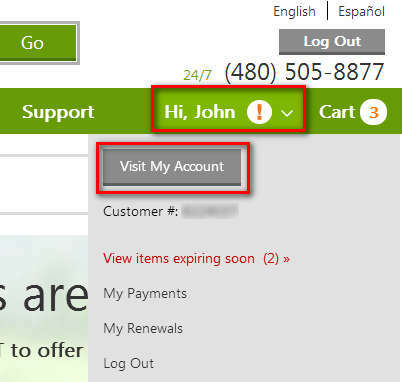 You will need to contact GoDaddy Support for help. These instructions are here as a courtesy to help our customers that are trying to move their domains away from GoDaddy to QTH.com. Click your name in the top menu, toward the right. For example, it might say "Hi, John" -- click that. Click "Visit My Account" in the drop down menu that appears after clicking your name. Click "Launch" next to Domains. In the "Settings" tab, find the "Lock" area. If it says "On" that means the domain is Locked. Click "Manage" and turn OFF the lock. Under the "Contacts" tab, you will see various contact information for "Registrant", "Administrative", "Technical" and "Billing". Do NOT make ANY changes to ANYTHING EXCEPT the Administrative Email Address.If you make additional changes, GoDaddy will impose a MANDATORY 60 day LOCK on your domain!!!! If the Administrative Email Address needs to be fixed, click "edit" next to "Administrative" and fix ONLY the Email Address. Back on the "Settings" tab, find the "Authorization Code" row and click "Email my code". GoDaddy will then send the Code to the email address listed as the Administrative Contact for your domain. Once you have received the email with the Transfer Code, you are ready to start the DOMAIN TRANSFER PROCESS with QTH.com. PLEASE NOTE: We are not affiliated with GoDaddy and cannot help you with any of the steps above. You will need to contact GoDaddy Support for help. These instructions are here as a courtesy to help our customers that are trying to move their domains away from GoDaddy to QTH.com.